Vested benefits from a Private Pension plan can’t be received in cash until retirement. 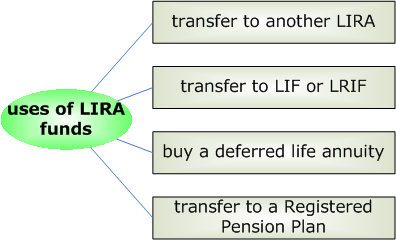 So if you leave an employee your before retirement, your vested benefits must go to a Locked-In Retirement Account (LIRA). You get the same investment choices as regular RRSPs (managed or self-directed). Generally the same restrictions on withdrawals apply as with the original Private Pension plan.